Come on in, we're at your service. Just how to get out of here. Arnold Schoenberg (cello) at the time of his Brettl-Lieder/Cabaret Songs. How charming this invitation from the Leo Strauss Ensemble to join it for an evening of cabaret! And how ironic, uncanny, and tragic to know that most of those who joined them for the cabaret evenings they performed in the Terezín/Theresienstadt concentration camp never did "get out of here." 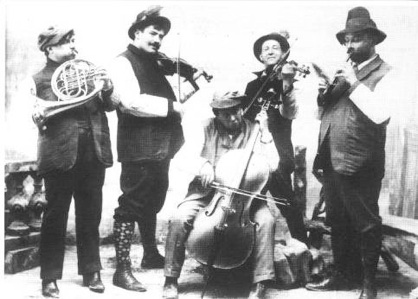 The Strauss Ensemble offered a moment of sound in a world of silence, and in so doing the troupe joined Leo Strauss (1897–1944) in sustaining the historical tradition of cabaret to which Jewish musicians, writers, and actors had so richly contributed. Jewish cabaret formed at the confluence of sound, with streams gathered from the sacred and the profane, mundane and political, vernacular and elite. The heritage of the Jewish cabaret was vast, stretching across generations and boundaries of every kind. Kurt Tucholsky, Kurt Weill, Hanns Eisler, Kurt Gerron, even Theodor Herzl in his Zionist writings and Leo Strauss's own father, Oscar Straus, the great operetta composer and mentor of Arnold Schoenberg when he arrived in Berlin to perform and compose cabaret on the eve of his turn toward modernism—all were cabaretistes. By 1944, cabaret spilled from the stages of clubs, dance halls, theaters, and film, enveloping and envoicing the global soundscape of Jewish modernity. Recordings courtesy of Cedille Records. All rights reserved. It is to cabaret's ability to turn worlds inside-out that I here call "the cabaretesque," a term that extends Mikhail Bakhtin's well-known concept of the carnivalesque. The cabaret stage depends on the inversion of inside and outside, the ways in which a skit or song allows the audience to experience themselves upon the stage without, however, entirely recognizing themselves. Audience members laugh at their own foibles and follies. They encounter themselves in a moment of self-reflection. The serious is made comic; the comic is made serious. The irony of an evening of enjoyment, as Leo Strauss invites us to experience, is revealed in the difficulty of escaping that moment when sounded in the real world. The outer and inner worlds of the cabaretesque collide in Hanns Eisler's setting of Bertolt Brecht's "The Ballad of the 'Jewish Whore' Marie Sanders." Eisler (1898–1962) captures the form and narrative of broadside ballad—songs that detail the politics of the day and circulate in printed form on the streets of the city—to open a space for Marie Sanders to enter the public sphere in which she is mocked and driven from the city because she has a Jewish lover. Sound in all its dimension—lyrics, genre, intertextuality, arrangement of the score for cabaret ensemble—unleashes its reality to locate it in the historical moment of the Nuremberg Laws. In successive verses, reality unfolds sonically as broadside and newsreel converge. Aesthetically, the hideous reality of prejudice and racism becomes transcendent as a song of stunning beauty. Although Marie Sanders herself never speaks in the song, we yearn to hear her voice. The serious work of cabaret resonates most clearly through the sounding of silence. It was the possibility of reclaiming silence for the marginalized that led to the spread of cabaret in the Jewish communities of the modern era, above all as they were forced to flee the traditions of an older world and embark on exile into a new world. These modern stories fueled the repertories of the cabaretesque, which were transformed into the Yiddish theater, operetta, and the film music of modernity. There were new voices and new songs to take up the cause of denying finality. The silence of modernity was sounded with a fullness that might seem to forestall the end of all things. 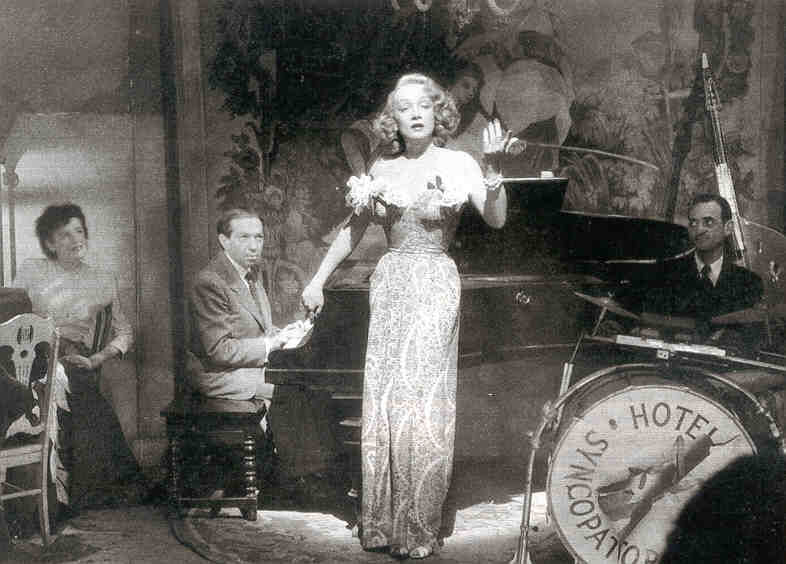 Friedrich Holländer and Marlene Dietrich on the Lorelei stage in Billy Wilder’s A Foreign Affair (1948). Want to buy some illusions? reaching high, built on sand. a spell you can't explain. you are in love in vain. slightly used, just like new? for laughs, some for tears. The power of Jewish cabaret and the cabaretesque to sound silence appears in remarkable ways across the history of media technology, particularly in the history of film. The history of sound film begins on a musical stage indebted to the long history of Jewish cabaret. In the first synchronized sound film, Alan Crosland's 1927 The Jazz Singer, the title character, Jakie Rabinowitz, takes to the stage as Jack Robin, enacting and envoicing the struggle between Jewish tradition in Samson Raphaelson's The Day of Atonement. The jazz singer inhabits the multiple worlds of the cabaretesque—as Al Jolson / Jakie Rabinowitz / Jack Robin—turning each inside-out through the transformation of speech (still silent in the film) into music. The jazz singer's musical transition from stage to film formed at the confluence of real-life transitions for European Jews at the beginning of the twentieth century—migration from rural shtetl to urban ghetto, immigration from the Old World to the New—and of allegorical transitions—from religious Orthodoxy to modern secularism, from Diaspora to cosmopolitanism. As the old order of European empire collapsed in the wake of World War I, the Jewish musical traditions gathered new metaphors of modernity and modernism, ripe for the tales migrating from the skits of the cabaret stage to the scenes filling the frames of sound film. The Jazz Singer was followed five years later in Berlin by Josef von Sternberg's 1930 Der blaue Engel (The blue angel), the first German-language synchronized sound film, and once again modernity was sounded on the cabaret stage. The Blue Angel of the film's title (based on Heinrich Mann's 1905 novel, Professor Unrat) was itself a cabaret, and most of the music was filmed diegetically in the Blue Angel, performed by Marlene Dietrich and Friedrich Holländer's jazz band, Weintraub's Syncopators. Jewish cabaret would sound historical silence again—and composed again by Friedrich Holländer (1896–1976) for performances by Marlene Dietrich in the Lorelei cabaret in Billy Wilder's 1948 A Foreign Affair. The historical arc from the cabaret stage of the Blue Angel to that of the Lorelei, from the eve of Nazism to the wake of the Shoah, once again is sounded as film music from which Jewish cabaret is inseparable, just as reality has collapsed into illusion. Back home. . . .
Recording courtesy of Cedille Records. All rights reserved. The voice of Leo Strauss closes this essay again as at the beginning, in both instances from the final collections of cabaret songs he left in Terezín before his own deportation and murder in Auschwitz. The search closure in the closing epigraph—the sound of his own father's voice, at home, not from the cabaret stage—proved to be as inchoate as it was impossible. Closure, however, may never be fully accomplished by the cabaretesque. The silence it would seem to secure is one that Jewish cabaret seeks instead to undo by insisting that silence must be sounded again and again. It is with and through sound that cabaret realizes the very Jewishness from which modern history is inseparable. Source for Leo Strauss lyrics: Migdal, Ulrike, ed. Und die Musik spielt dazu: Chansons und Satiren aus dem KZ Theresienstadt (Munich: Piper, 1986). Philip V. Bohlman is Ludwig Rosenberger Distinguished Service Professor at the University of Chicago. Among his recent books are Hanns Eisler – “In der Musik ist es anders,” with Andrea F. Bohlman, (Hentrich & Hentrich, 2012) and Wie sängen wir Seinen Gesang auf dem Boden der Fremde! (LIT Verlag, 2016). He is artistic director of the New Budapest Orpheum Society, whose As Dreams Fall Apart (Cedille Records) received a 2016 Grammy Nomination.